We are excited to tell you about Invisalign’s new SmartTrack aligner material, which provides a more gentle constant force and improve control of tooth movements, making for faster treatment. SmartTrack delivers a gentler, more constant force throughout each two-week portion of your Invisalign treatment, making your progress easier to track. SmartTrack’s highly elastic material is more damage-resistant, and returns more closely to the programmed aligner shape when stretched or bent. The increased flexibility also mean that SmartTrack can achieve a more precise fit, making for a more efficient treatment process. SmartTrack’s flexibility makes your aligners more comfortable to wear, and easier to insert and remove, too. However, it still provides the same clarity and aesthetic benefits that you’ve come to expect from Invisalign, making for a more comfortable and nearly invisible treatment from day one. 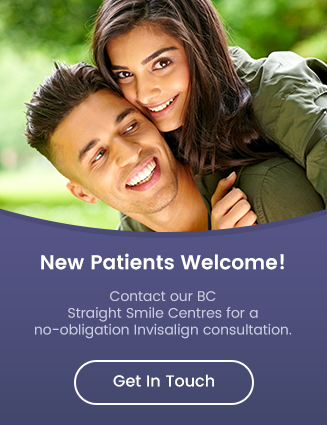 To learn more about Invisalign SmartTrack, contact a Straight Smile Centre member practice today!